When you charter a private jet to Winston-Salem with Charter Flight Group, you are in for a treat. With over 30 years experience in operating private flight service, CFG has built a reputation for safety, reliability, and comfort. Whether your charter flight takes to or from Winston-Salem, one of our knowledgeable flight consultants are ready to help you plan the exact trip to meet your needs and we are there for you 24/7. Charter Flight Group has managed to weather even the toughest economic downturns in the private charter industry for one very good reason: Safety. Safe and secure flights make for reliable, on-time flights. Two of the biggest concerns most busy executives express is getting to their destination safely and on-time. At CFG, this is not an issue. To ensure that our jets are consistently on time, we bring in the best aircraft consultants to ensure that our service not only meets, but exceeds all FAA regulations. This helps us ensure that we have the safest aircraft, the best and more reliable pilots behind the controls, and top maintenance workers on the ground. It all adds up to one thing: Your private jet arrives with you intact, rested, and ready to tackle that big contract. Naturally, when booking your private flight, you are going to want to ensure that you have exactly the right kind of plane at your disposal. CFG, has a vast array of jets to charter: If you need a small jet, consider a Saab 2000; if you require something larger, then perhaps you will want to fly with either a Falcon 10 or 20 jet; or maybe you need to bring the entire company along for this trip. In that case, charter your own private Global 5000 or a Boeing Business Jet. Regardless of how many will be traveling with you, we have the right private charter to ensure a smooth and productive flight. Be sure to ask your private air consultant about making ground transport arrangements. Your plane will arrive on-time at Smith-Reynolds Airport just north of Winston-Salem. You will be rested and ready to handle whatever business or pleasure you have planned. 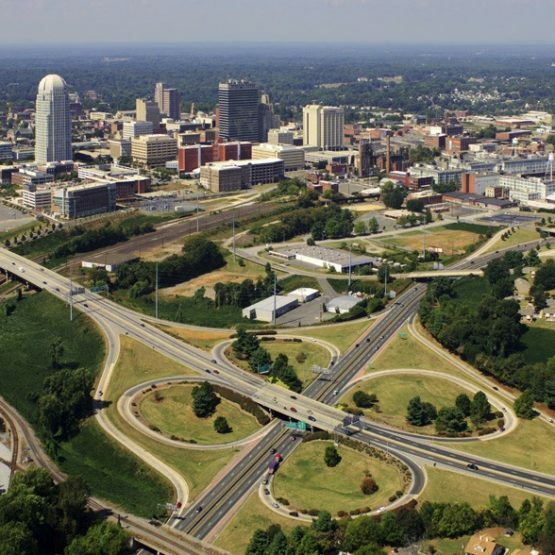 The Airport is situated adjacent to North Carolina Highway 8, which traveling south will bring you into the center of Winston-Salem.From there, you can take I-40 Business Loop (also called U.S. 158) to all points east or west. Whatever the reason you charter a private flight, one of our flying consultants can help you plan the rest of your trip so that there are no surprises. From air to ground, Charter Flight Group sees to it that your trip is perfect. 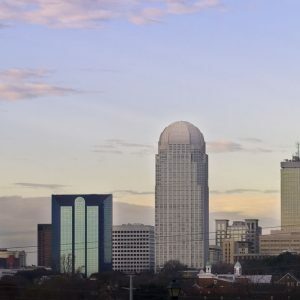 Winston-Salem has a rich and varied history and upon arrival of your flight, you are sure to want to check out some of the sights. Naturally, if you book a private jet for business, you will have some idea of what is in store. Winston-Salem is home to some of the largest and most influential corporations in the nation. Winston-Salem is home to RJ Reynolds, Wachovia Bank, and Krispy Kreme Donuts (well, the first location is here).But if you are planning some R & R after disembarking from your private charter, be sure to check out Reynolda House Museum of American Art, considered by many in Winston-Salem to be their number one attraction. Or perhaps you would like to get deeper into the history of the area; in that case, you may want to visit God’s Acre (a cemetery like none you have been to before) or Single Brother’s House. In addition, Winston-Salem has some of the finest Golf fairways you may ever play. Charter Flight Group, with our long and unblemished safety, reliability, and security record, is the choice for most busy professionals seeking to charter a private flight. When booking your private jet, you will understand why this is the premier choice among charter travelers. With courteous, professional, and knowledgeable private flying consultants, every step of the journey is smooth and carefree, so that you can focus on what is important to you.